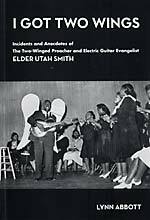 Incidents And Anecdotes of The Two-Winged Preacher And Electric Guitar Evangelist Elder Utah Smith "Despite waxing three of the hottest electric guitar records of the pre-rock and roll years, almost nothing has been known about the life of the sanctified electric guitar preacher Elder Utah Smith. Until now. African-American music scholar Lynn Abbott's years of research has produced a remarkable biographical study finally shining a light onto the preaching, healing and guitar playing ministry of this path breaking performer, one whose revivals and appearances were as well known and anticipated in his time as any other sacred or secular musician or performer. I Got Two Wings firmly places Utah Smith within the Church of God of Christ tradition along with such COGIC contemporaries as Sister Rosetta Tharpe, Elder Curry and the Rev F W McGee. Filled with fascinating anecdotes and first hand remembrances and testimonies, I Got Two Wings also features many rare and unpublished photographs and an 18-track CD produced by CaseQuarter's Kevin Nutt. The CD includes 5 previously unknown Utah Smith songs along with relevant performances by Tharpe, Curry, McGee and two rocking, sanctified performances by Utah Smith's daughter, Sister Sarah James and the Sanctified Six." 128-page perfect bound softcover book and 18-track CD sealed in pouch inside back cover. "The return of the CaseQuarter label to active duty has long been promised; this year 2007 it is true to be! The Spiritualaires of Hurtsboro, Alabama are one of the very last still active gospel quartets with origins in gospel's golden age of the 1950s. Weaving together influences from the blues and country & western, The Spiritualaires over the years have remained faithful to their ever-distinct yet traditional sound. 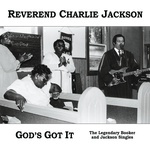 Drawn from recent studio recordings and live radio broadcasts, Singing Songs of Praise reveal The Spiritualaires as both a super-fine harmony quartet and a unique blues-guitar-driven ensemble. What a treat it is to have -- after almost six decades together -- the debut recording of The Spiritualaires of Hurtsboro, Alabama." "The CaseQuarter mission continues full-force with its second installment of the wondrous and sacred musical intensity and beauty that avails itself in the American South. This time it is a collection of contemporary recordings -- You Without Sin Cast The First Stone, the solo debut of singer/guitarist Isaiah Owens. In the early 1990s, Isaiah Owens ended a distinguished career singing lead with the gospel quartet the Flying Clouds of Montgomery, Alabama. Early in the 1980s, Owens began to teach himself guitar and soon began sitting in on local AM gospel radio broadcasts, most notably with the Montgomery Gospelaires and later with Ann Talbert's Cheerful Angels program. Always known for his dynamic vocals and piercing falsetto, Owens augmented the initial chords he taught himself with extremely loud volume. Along with emphasizing the rhythmic over the traditionally musical, Owens was not afraid to incorporate dissonance into his playing. The merging of Owens' unique guitar style with his accomplished vocals makes for an intriguing and original musical experience truly not heard anywhere else in the gospel world."